[ABOVE ] Portrait of the Brighton photographer Ebenezer Pannell (born 1860) taken at Pannell's photographic portrait studio at 49 St George's Road, Brighton around 1897. Ebenezer Pannell was born near Brighton during the first quarter of 1860. Ebenezer was the son of Rachel Banfield and William Pannell (1823-1897), a Brighton shopkeeper. At the time of his son�s birth, William Pannell was running a shop in George Street, Cliftonville (modern day Hove) and so Ebenezer�s birth was registered in the Steyning district, which embraced Cliftonville and Hove. Ebenezer Pannell generally gave his place of birth as Brighton, but in the 1891 census he declared that he was born in "Cliftonville, Hove". William Pannell, Ebenezer�s father, was born in Brighton in 1823, the son of Jane and George Pannell, a grocer and tea dealer. On 27th March 1848, William Pannell married Rachel Banfield (1822-1909) at St Nicholas� Church Brighton. In 1851, Rachel gave birth to a daughter named Frances Pannell. (The birth of Frances Pannell was registered in Brighton during the 2nd Quarter of 1851). Over the next five years, there were two new additions to the family - William George Pannell (born 1854) and George Robert Pannell (born 1856). During this period, William Pannell was managing his own grocery shop in Brighton�s Upper Bedford Street. Around 1859, William Pannell opened a shop at 75 George Street, Cliftonville, where his youngest son Ebenezer Pannell was born during the early part of 1860. (The Pannells were a non-conformist family and Ebenezer Pannell was not christened until he was 19. Ebenezer Pannell was baptised at St Peter's Church, Brighton, on 22nd October 1879. Ebenezer Pannell was later active as a Methodist lay preacher). By 1878, William Pannell and his family had moved back to Brighton. At the time of the 1881 census, William Pannell was running a lodging house at 23 Charlotte Street, Brighton. Charlotte Street ran into Marine Parade, which was on Brighton�s eastern seafront. William Pannell, the head of the household, is entered on the census return as a "Lodging House Keeper". William and Rachel Pannell�s thirty-year old daughter Fanny Pannell is described as a "Lady�s Help" on the 1881 census return. Ebenezer Pannell, then aged twenty-one, gives his occupation as "Photographer". The following year, Ebenezer Pannell married Mary Ann Baker, a thirty year old hairdresser's assistant. [The marriage between Ebenezer Pannell and Mary Ann Baker was registered in Brighton during the 4th Quarter of 1882]. 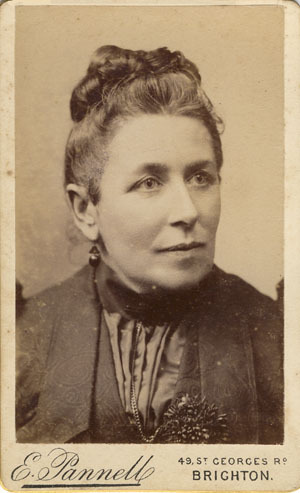 Mary Ann Baker, Ebenezer Pannell's wife had been born in London around 1853, but at the time of the 1881 census, Mary Ann was boarding with Sarah and Henry Slater, a Brighton hairdresser, at 112 St George's Road, Brighton. Mary Ann was one of three hairdresser's assistants living at this address in 1881, the other two being Henry Slater's sons - John Henry Slater, aged 19, and Albert Edward Slater, aged 18. 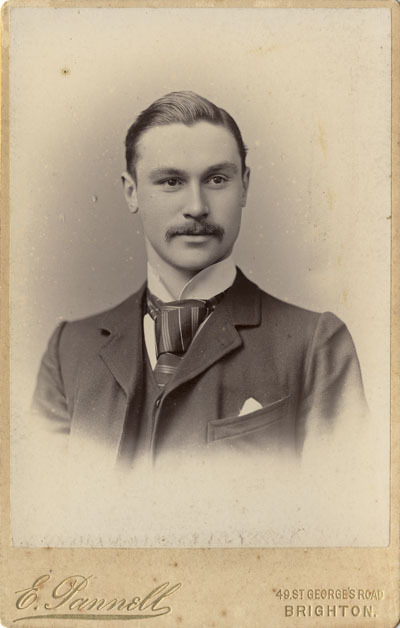 Interestingly, the youngest son, Albert Edward Slater (born 1863, Brighton) was later to become a professional photographer, running his own photographic portrait studio at 24 St George's Road, Brighton, between 1881 and 1899. [ABOVE ] Group Portrait of the Pannell Family (c1890). 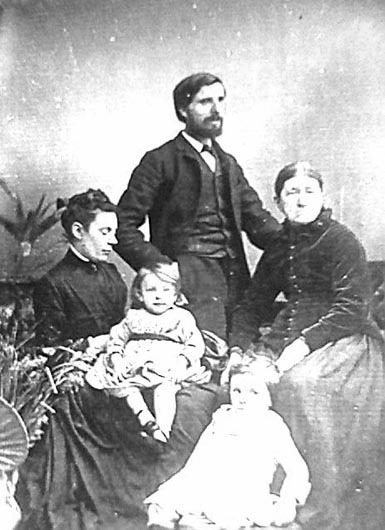 Ebenezer Pannell (born 1860), his wife Mary Ann Baker (born c1853), their two children - Ella Mary Pannell (born 1888), and Ebenezer William Pannell (born 1886). Ebenezer's Mother-in-Law, Mrs Mary Baker (born c1820, Hereford) is seated on the right. When this photograph was taken, Ebenezer Pannell was residing with his family at 49 St George's Road, Brighton. In 1881 Ebenezer Pannell was probably employed as a photographer in one of Brighton�s many photographic portrait studios. (In 1881, there were over thirty photographic studios in Brighton). 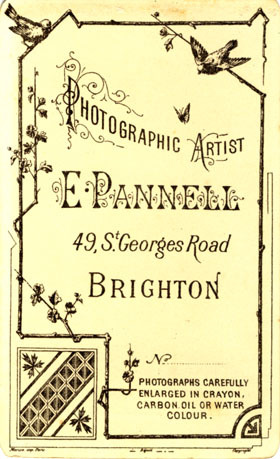 By 1883, Ebenezer Pannell was running his own photographic studio at 21 Canning Street, Brighton. Canning Street was in the residential area north of Kemp Town�s Eastern Road, close to the Sussex County Hospital (now the Royal Sussex County Hospital). A carte-de-visite portrait of an elderly man, photographed by Ebenezer Pannell at 21 Canning Street, Brighton, carries on the reverse of the carte a printed date of "Nov. 19th 1883", which helps to date Ebenezer's entry into professional photography. As Ebenezer Pannell was not based in the central commercial district of Brighton, his name does not appear in the list of professional photographers published in Brighton trade directories between 1883 and 1887. 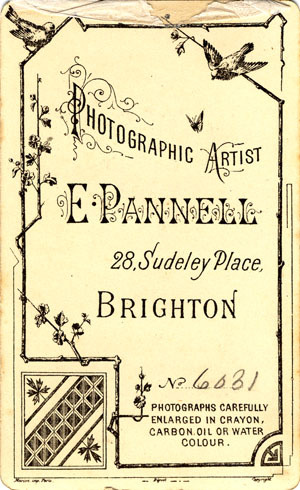 It was not until 1888, when he established a photographic studio at 28 Sudeley Place, Brighton, that Ebenezer Pannell was first entered in a Brighton trade directory as a professional photographer. 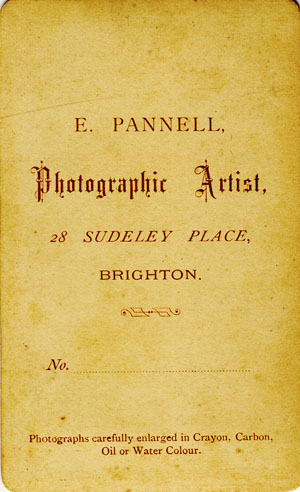 The 1888 edition of Pike�s Directory of Brighton & Hove lists E. Pannell as a photographer at 28 Sudeley Place, Brighton. Located in the heart of Brighton�s Kemp Town, Sudeley Place is a small street immediately south of the Royal Sussex County Hospital and runs down from Eastern Road to St George�s Road. Before the end of the year, Ebenezer Pannell opened a second studio in St George�s Road, one of Kemp Town�s main shopping streets. Page�s Brighton Directory of 1888 lists Ebenezer Pannell as a photographer at 28 Sudeley Place and 53 St George�s Road, Brighton. The following year, Pike�s 1888 Directory of Brighton & Hove lists Ebenezer Pannell as a photographer at 49 St George�s Road, Brighton, where he was to remain for the next 15 years or so. [ABOVE] A map showing Eastern Brighton and Kemp Town in Victorian times. 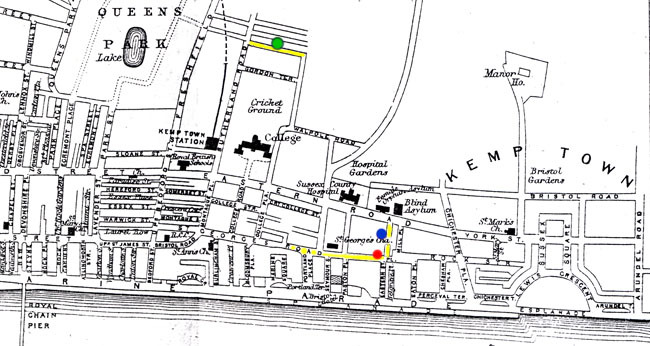 The location of Ebenezer Pannell's studios are marked by coloured dots - 21 Canning Street (green dot), 28 Sudeley Place (blue dot) and 49 St George's Road (red dot). During the late 1880s Ebenezer Pannell�s photographic business was divided between Sudeley Place, where his sister Miss Frances Pannell, a photographic artist, resided and St George�s Road, Brighton, where Ebenezer Pannell lived with his wife Mary Ann and their two children. It appears that around 1888, Ebenezer Pannell and his family had moved to 53 St George�s Road, Brighton, where the young photographer set up a photographic portrait studio. Within a couple of years, Ebenezer Pannell's studio address had changed from No.53 St George�s Road, Brighton to No. 49 St George�s Road, Brighton. It is not clear whether Pannell moved his studio to a building a few doors away or whether the houses in St George's Road had been re-numbered between 1888 and 1890. The 1890 edition of Kelly�s Directory of Sussex records Ebenezer Pannell as a "photographic artist" at 49 St George�s Road, Kemp Town, and as an "artist" at 28 Sudeley Place, Kemp Town. The 1891 census return details how Pannell�s business operations were divided between Sudeley Place and St George�s Road. 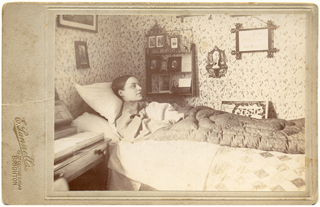 Ebenezer�s sister Frances Pannell, described as a "Photographic Artist", aged 40, is shown residing at 27 Sudeley Place with her parents. Ebenezer�s father, sixty-seven year old William Pannell is entered on the census return as a �Waiter at an Inn�. Mrs Rachel Pannell, William Pannell�s wife, is recorded on the census return as "blind since 1888". 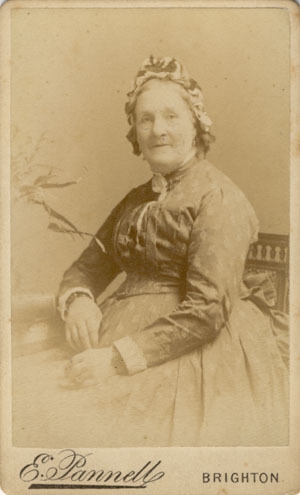 Mrs Rachel Pannell died in 1897 at the age of 74. William Pannell continued to work as a waiter well into old age. (The 1901 census records William Pannell as a seventy-eight year old "hotel waiter". 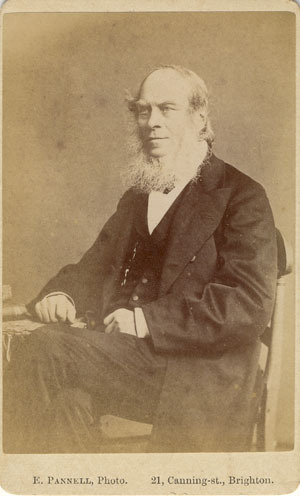 William Pannell died in 1909 at the age of eighty-five). At the time of the 1891 census, Ebenezer Pannell was residing at 9 St George�s Road, Kemp Town, Brighton, with his thirty-eight year old wife Mary Ann Pannell and their two children, four year old Ebenezer junior and two year old Ella. On the census return Ebenezer Pannell is recorded as a "Photographic Artist", aged 30. [ABOVE] Extracts from two trade directories published in 1890, showing the listings of professional photographers with studios in Brighton and Sussex. 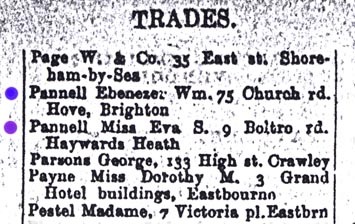 The 1890 edition of Page's Directory of Brighton, records Ebenezer Pannell as a photographer with two studios in Brighton, one at 28 Sudeley Place and the other at 53 St George's Road. Kelly's Directory of Sussex, published in 1890, lists the Sudeley Place studio, but gives the number of the studio in St George's Road as No. 49 rather than No. 53, the number of the building given in Page's Directory. [ABOVE] A map of Eastern Brighton showing the location of Ebenezer Pannell's two photographic studios in Kemp Town - 49 St George's Road and 28 Sudeley Place, Brighton. [ABOVE] The trade plate of Ebenezer Pannell, Photographic Artist of 28 Sudeley Place, Brighton, as printed on the reverse of a carte-de-visite (c1888). 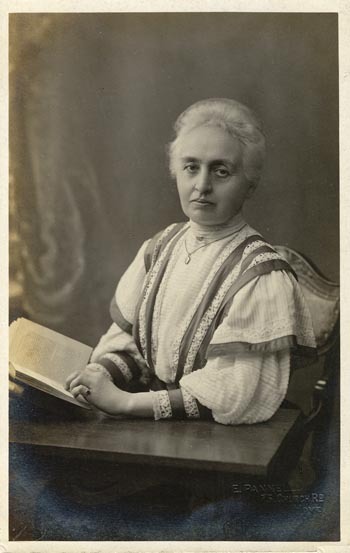 The studio at 28 Sudeley Place was managed by Ebenezer's sister Frances Pannell, who described herself as a "Photographic Artist on census returns. [ABOVE] The trade plate of Ebenezer Pannell, Photographic Artist of 49 St George's Road, Brighton, as printed on the reverse of a carte-de-visite (c1889). The photographer Ebenezer Pannell operated as a photographer at 49 St George's Road, Brighton, while his sister Miss Fanny Pannell managed the Pannell studio at 28 Sudeley Place, Brighton. [ABOVE ] Group Portrait of the Pannell Family (c1897). 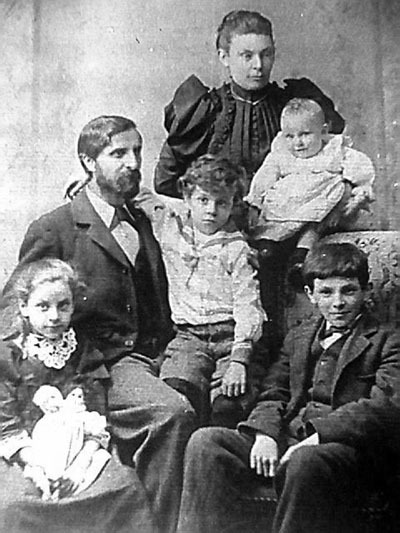 Ebenezer Pannell (born 1860) with his wife Mary Ann Baker (born c1853) and their four children (left to right) Ella Mary Pannell (born 1888), Gordon Pannell (born 1892), Eva Sarah Pannell (born 1896) and Ebenezer William Pannell (born 1886). Ella Pannell, Ebenezer William Pannell and his younger sister Eva Pannell all became professional photographers in adult life. 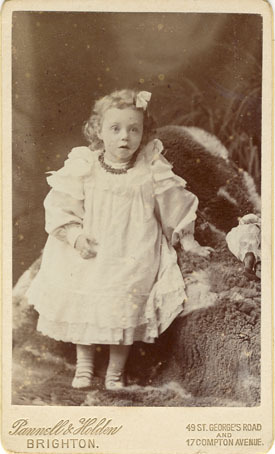 Gordon George Pannell was the only one of Ebenezer Pannell's four children who did not pursue a photographic career. Gordon Pannell emigrated to Australia as a young man and, after serving in the Australian Army during the First World War, he settled in Western Australia and became a farmer. During their marriage, Ebenezer and Mary Ann Pannell produced at least four children - Ebenezer William Pannell (born during the 4th Qtr of 1886 in Brighton), Ella Mary Pannell (born during the 4th Qtr of 1888 in Brighton), Gordon George Pannell (born during the1st Qtr of 1892 in Brighton) and Eva Sarah Pannell (born during the 4th Qtr of 1896 in Brighton). Ella Pannell and Ebenezer William Pannell became professional photographers in adult life. Ebenezer William Pannell went on to establish his own photographic studios in Burgess Hill and Haywards Heath and his younger sister Eva Pannell operated a photographic portrait studio at 9 Boltro Road, Haywards Heath for a number of years during the 1920s and 1930s and throughout the Second World War. Gordon Pannell emigrated to Australia and did not pursue a photographic career. People are often confused by the fact that there were two photographers named "Ebenezer Pannell" who were active in Sussex during the early years of the 20th century. Ebenezer Pannell senior (1860-1934) was a professional photographer who operated mainly in the towns of Brighton and Hove. Ebenezer Pannell senior's son, Ebenezer William Pannell (1886-1951) ran studios in Burgess Hill, Haywards Heath and Hurstpierpoint before he took over his father's studio at 75 Church Road, Hove. Ebenezer Pannell junior usually labelled his photographs "E. W. Pannell" and in most directory listings he is recorded as Ebenezer William Pannell. After his father retired around 1917, Ebenezer Pannell junior dropped his middle name in trade listings but retained "E. W. Pannell" as his trading name. Ebenezer Pannell and Mary Ann Baker were the parents of four children - Ebenezer William Pannell, Ella Mary Pannell, Gordon George Pannell and Eva Sarah Pannell. Ebenezer William Pannell (born 1886, Brighton) the eldest son of the photographer Ebenezer Pannell senior, followed his father's profession. After assisting his father at his photographic portrait studio in Church Road, Hove, Ebenezer William Pannell took over the management of Pannell's Studios in Burgess Hill and Haywards Heath. [See the section on Ebenezer William Pannell at the foot of this webpage]. 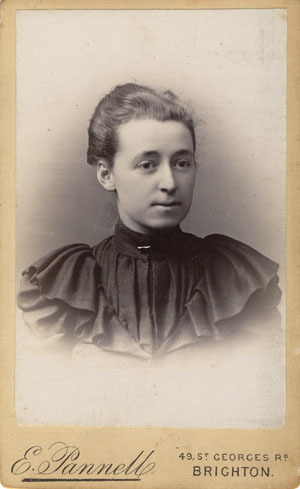 As a young woman, Ella Mary Pannell (born 1888, Brighton) assisted her father in his photographic businesses in Brighton and Hove. The 1911 census records Ella Mary Pannell as twenty-two year old "Photographic Artist" based at Ebenezer Pannell's studio in Church Road, Hove. In 1915, Ella Pannell married Percy John Buffard (born 1884, Hammersmith, London), a former gardener and nurseryman, who after studying Divinity at Regent's Park College, became an ardent Baptist and anti-Catholic missionary in Spain. 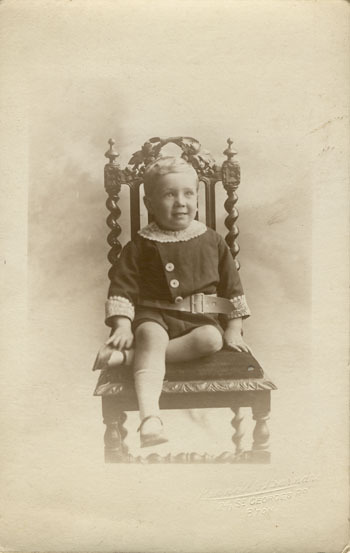 Gordon George Pannell (born 1892, Brighton), the youngest son of the Brighton & Hove photographer Ebenezer Pannell senior, emigrated to Australia as a young man. Gordon Pannell found work as a "farm hand" in Quairading, Western Australia, a settlement some 100 miles east of Perth. In March 1915, at the age of twenty-three, Gordon Pannell enlisted in the 28th Infantry Battalion of the Australian Army (Australian Imperial Force). On 29th June 1915, Private Gordon Pannell embarked with other members of 'A Company' from Fremantle on board the Australian Transport Ship 'Ascanius'. After two months of training in Egypt, Private Gordon Pannell arrived in Gallipoli in September 1915. After taking part in the Gallipoli campaign, Gordon Pannell and other members of the 28th Battalion were shipped out to France to serve on the Western Front. Private Gordon Pannell returned to Australia on 1st February 1918. At the end of the First World War, Gordon Pannell made his way back to the Quairading district of Western Australia where he established a farm at Mount Stirling. Gordon Pannell married Coral Winifred Phillips and fathered four children - Gordon, Phillip. Coral and Bruce Pannell. Gordon George Pannell died at Quairading Hospital, Western Australia on 16th September 1952, at the age of 60. Gordon Pannell, like his father, was non-conformist in religion and his remains were laid to rest in the Methodist Cemetery at Quairading. Ebenezer Pannell senior's youngest daughter, Eva Sarah Pannell (born 1896, Brighton) became a professional photographer like her father. After assisting her father in his Hove studio, Eva Pannell re-located to Haywards Heath to help her brother Ebenezer William Pannell run Pannell's Studio in Haywards Heath. When Ebenezer Pannell senior retired around 1917, Ebenezer William Pannell returned to Hove to run Pannell's photographic studio at 75 Church Road, Hove. Pannell's studio in Haywards Heath passed to Eva Pannell. Miss Pannell was the sole proprietor of the photographic portrait studio at 9 Boltro Road, Haywards Heath, throughout the 1930s. [See the section on Eva Pannell at the foot of this webpage]. 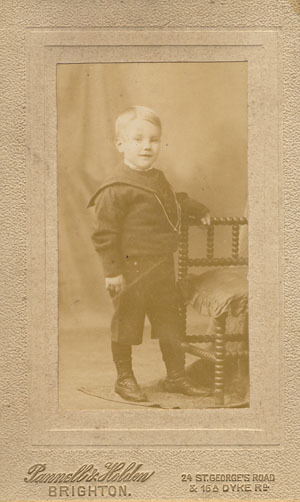 [ABOVE ] A portrait of Gordon George Pannell (born 1892, Brighton), photographed by his father Ebenezer Pannell around 1906. Gordon Pannell emigrated to Australia as a young man and after serving with the Australian Imperial Force during the First World War he became a farmer at Mount Stirling in the Quairading district of Western Australia. Gordon Pannell died in Quairading, Western Australia on 16th September 1952, aged 60. [ABOVE] Reverse of a carte-de-visite portrait produced by Ebenezer Pannell, Photographic Artist, 49 St George's Road, Brighton. 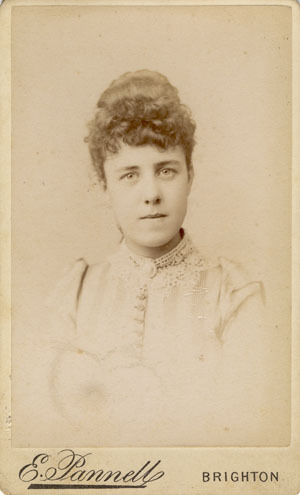 (c1889) [ABOVE] Carte-de-visite portrait of a young woman by Ebenezer Pannell, 49 St George's Road, Brighton. (c1901). Negative No. D1728. [ABOVE] Carte-de-visite portrait of a young woman by Ebenezer Pannell, 49 St George's Road, Brighton. 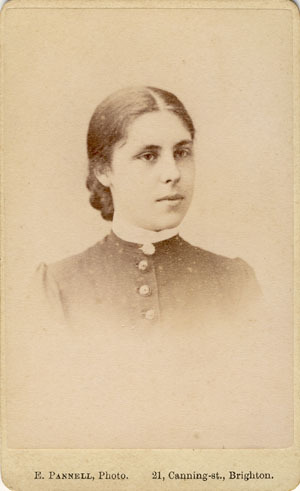 (c1889). 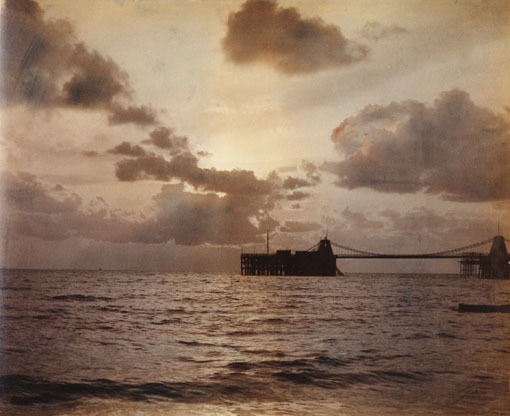 [ABOVE] Seascape with Brighton's Chain Pier, a large, hand-tinted photographic print produced around 1895 by Ebenezer Pannell of 49 St George's Road, Brighton. Ebenezer Pannell made a number of photographs of Brighton's Chain Pier during the 1890s. Photographs of Brighton Front, Royal Chain Pier. Copyright owner of the work: Edward Moulton, Young Men's Christian Association, 55 Old Steine, Brighton. Copyright author of the work: Ebenezer Pannell, 49 St George's Road, Brighton. Registration form completed 27th February 1895. Registration date-stamped 28th February 1895. Photograph of the Royal Chain Pier, Brighton. Copyright owner of the work: Ebenezer Pannell, 49 St George's Road, Brighton. Copyright author of the work: Ebenezer Pannell, 49 St George's Road, Brighton. Registration form completed 12th December 1896. Registration date-stamped 14th December 1896. Photograph of the Wreck of the Royal Chain Pier, Brighton. Copyright owner of the work: Ebenezer Pannell, 49 St George's Road, Brighton. 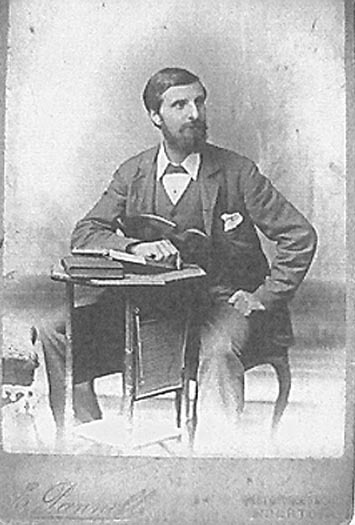 Copyright author of the work: Ebenezer Pannell, 49 St George's Road, Brighton. Registration form completed 12th December 1896. Registration date-stamped 14th December 1896. Photographs of the Royal Chain Pier, Brighton (four positions). Copyright owner of the work: Ebenezer Pannell, 49 St George's Road, Brighton. Copyright author of the work: Ebenezer Pannell, 49 St George's Road, Brighton. Registration form completed 6th January 1897. Registration date-stamped 7th January 1897. [ABOVE] Details of photographs of the Royal Chain Pier, as registered at the Copyright Office of the Stationers' Company in London by the Brighton photographer Ebenezer Pannell between 1895 and 1897. 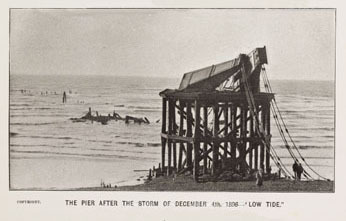 Ebenezer Pannell registered for copyright his photograph of the wrecked pier a week after he photographed the storm damaged pier on 5th December 1896. Ebenezer Pannell is associated with a number of photographs taken of The Royal Chain Pier, the first pier to be constructed in Brighton. The Royal Suspension Chain Pier was designed by Captain Samuel Brown (1774-1852), a retired naval officer, engineer, and iron chain manufacturer. A site was chosen on Brighton's eastern seafront at the foot of the East Cliff, below the New Steine, east of the Old Steine and not far from Marine Parade. Construction of the Chain Pier began towards the end of 1822 and the pier was completed by September 1823, at a cost of �30,000. The Chain Pier was opened to the public on 25th November 1823. The Royal Chain Pier consisted of a platform 1,134 feet in length and 13 feet wide, paved with Purbeck stone. The platform was suspended from iron rods, hanging from chains that were strung from a series of cast iron towers. The Royal Chain Pier had been built as a landing stage for passenger vessels that crossed the English Channel between Brighton and the French port of Dieppe. However, the Chain Pier also proved popular with visitors to Brighton as it provided a pleasant promenade for holidaymakers and locals alike. Small shops and stalls offering refreshments and souvenirs were installed at the pier-head and the hollow iron towers contained kiosks selling sweets, toys and gifts. The Royal Chain Pier proved to be a popular subject for artists and photographers. Ebenezer Pannell was one of several Brighton photographers who made photographic studies of the Royal Chain Pier. (Other Brighton photographers who created images of the Royal Chain Pier include Edward Fox, William Mason junior and Thomas Donovan). On the evening of 4th December 1896, the Royal Chain Pier was completely destroyed in a violent storm. Ebenezer Pannell and another Brighton photographer Thomas Donovan took several pictures of the broken pier over the next few days. On 12th December 1896, Ebenezer Pannell registered for copyright a photograph of the wreck of the Royal Chain Pier at the Copyright Office of the Stationers' Company in London. The photographs of the Royal Chain Pier taken by Ebenezer Pannell and Thomas Donovan were used to illustrate John George Bishop's book The Brighton Chain Pier, published in 1897..
[ABOVE] Two photographs of Brighton's Chain Pier by Ebenezer Pannell of 49 St George's Road, Brighton (1896). 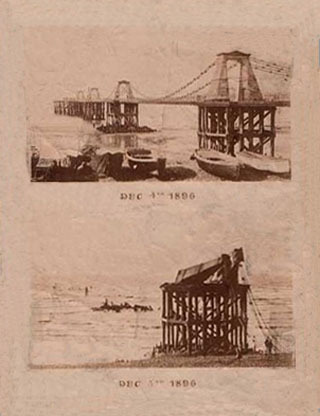 The two photographs, one captioned "DEC 4th 1896", the other entitled "DEC 5th 1896", are supposed to to show the Chain Pier as it appeared (top) before the great storm of 4th December 1896 and (bottom) as a complete wreck the day after the violent storm destroyed the old iron pier. These two photographs by Ebenezer Pannell were mounted on a stiff card and sold to the general public to commemorate the destruction of the Chain Pier. The card mount carries the photographer's credit "E. PANNELL. PHOTO. BRIGHTON"
[ABOVE] "The Pier after the Storm of December 4th, 1896 - Low Tide" a photograph by Ebenezer Pannell which was used to illustrate the book The Brighton Chain Pier by John George Bishop (1897). 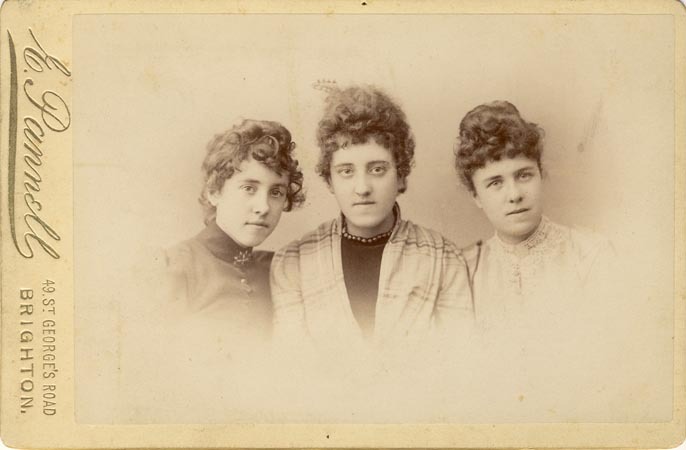 [ABOVE] A cabinet portrait of three young women by Ebenezer Pannell, 49 St George's Road, Brighton (c1890). This cabinet photograph, carries the trade plate "E. Pannell, 49 St George's Road, Brighton". [ABOVE] A cabinet portrait of a bearded man by Ebenezer Pannell, 49 St George's Road, Brighton. (c1900). [ABOVE] A cabinet portrait of a man wearing a striped tie by Ebenezer Pannell, 49 St George's Road, Brighton. (c1900). [ABOVE] Carte-de-visite portrait of an unknown woman by Ebenezer Pannell, 49 St George's Road, Brighton. (c1897). Negative No. B3094 [ABOVE] Carte-de-visite portrait of a young woman with winged-collar by Ebenezer Pannell, 49 St George's Road, Brighton. (c1898). Negative No. 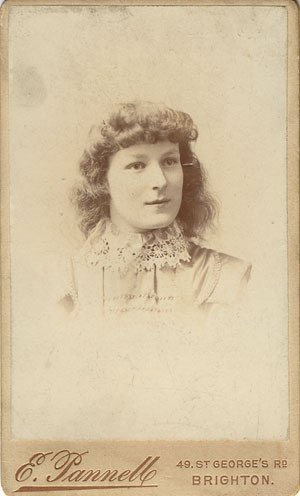 B1654 [ABOVE] Carte-de-visite portrait of a young woman with fair hair by Ebenezer Pannell, 49 St George's Road, Brighton. (c1900). Negative No. D4001. From about 1901 until 1905, Ebenezer Pannell and his sister Frances Pannell were in a business partnership with a young Sussex photographer named Frederick James Holden. Frederick James Holden was born at Pulborough, Sussex, in January 1873, the son of Harriet and Frederick Holden, a railway signalman. During the early 1890s, when he was just a teenager, Frederick Holden was employed as a photographer�s assistant in one of Ebenezer Pannell�s studios. The 1891 census records Frederick Holden as an 18 year old "Photographer" at 28 Sudeley Place, Brighton, one of the two studios operated by Ebenezer Pannell and his sister Frances Pannell. At the time of the 1891 census, Ebenezer Pannell was residing with his wife and children at 49 St George's Road, Brighton and eighteen year old Frederick Holden was lodging with Miss Fanny Pannell at 28 Sudeley Place, Brighton. Around 1895, Frederick Holden established his own photographic studio at 6 Bank Buildings, Burgess Hill, West Sussex. In 1900, after four years as a photographer in Burgess Hill, Frederick Holden was invited to join his former employer in a business partnership, to trade under the name of Pannell & Holden. The firm of Pannell & Holden opened two studios in the space of two years, one at 16 Dyke Road, Brighton, the other at Pannell�s new residence at 17 Compton Avenue in the Fiveways area of Brighton. By 1901, the firm of Pannell & Holden was operating three studios in Brighton. Ebenezer Pannell and his young business partner Frederick James Holden (born 1873, Pulborough, Sussex), with the assistance of Pannell's older sister Frances "Fanny" Pannell (born 1851, Brighton) managed studios at 49 St George's Road, 16A Dyke Road and 17 Compton Avenue, Brighton. It appears that the firm of Pannell & Holden was jointly owned by these three photographers. When the 1901 census was taken, all three photographers were recorded at 17 Compton Avenue, Brighton. Ebenezer Pannell, his older sister Fanny Pannell and Frederick James Holden are each described on the census return as "Photo Artists" and "Employers". [ABOVE] Details of the occupants of 17 Compton Avenue, Brighton, as recorded in the 1901 census. 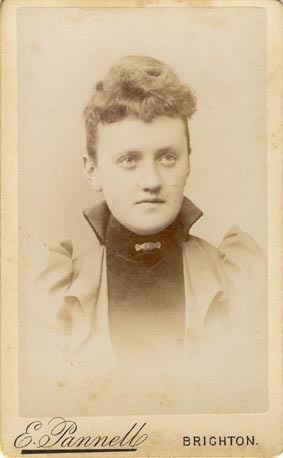 [ABOVE] Carte-de-visite portrait of a young woman by Pannell & Holden, 49 St George's Road and 17 Compton Avenue, Brighton. (c1902). 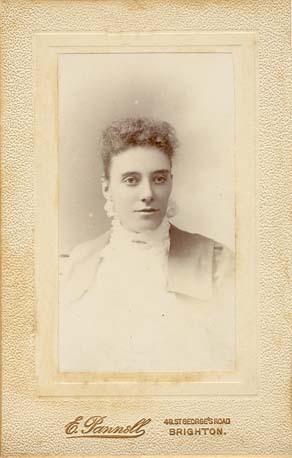 [ABOVE] Carte-de-visite portrait of an unknown woman by Pannell & Holden, 49 St George's Road and 17 Compton Avenue, Brighton. (c1902). 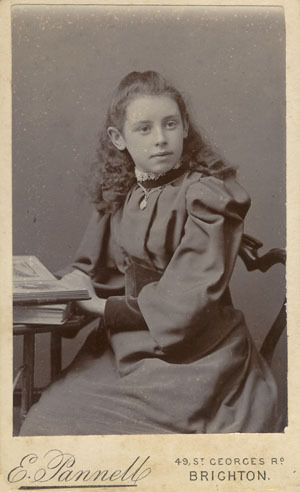 [ABOVE] Carte-de-visite portrait of a young girl by Pannell & Holden, 49 St George's Road and 17 Compton Avenue, Brighton. (c1902). 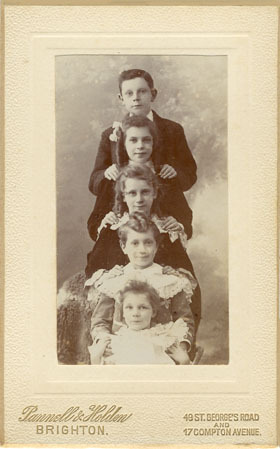 [ABOVE] Carte-de-visite group portrait of five siblings by Pannell & Holden, 49 St George's Road and 17 Compton Avenue, Brighton. (c1902). 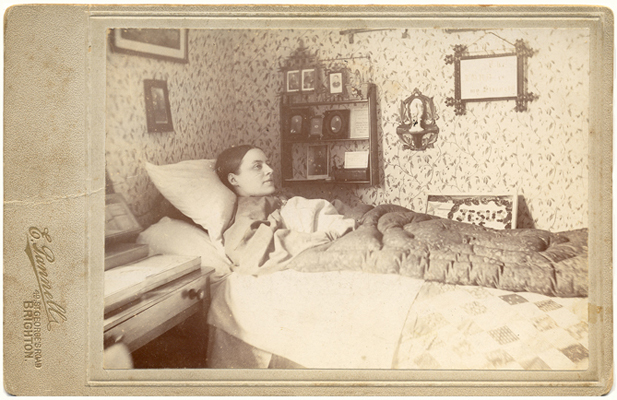 [LEFT] Portrait of a woman in her sickbed, photographed at the subject's home by a photographer from the firm of Pannell & Holden (c1902). This cabinet photograph, carries the trade plate "Pannell & Holden, 49 St George's Road & 17 Compton Avenue, Brighton". Around 1903, the firm of Pannell & Holden acquired the photographic studio at 24 St George's Road, Brighton, which had previously been operated by two photographers from South London, Stanley Mann (born 1871, Kenningon, Lambeth) and his younger brother Sidney Herbert Mann (born 1873, Kennington, Lambeth) who worked under the name of Mann Brothers. Between 1901 and 1905, the firm of Pannell & Holden operated from a number of studios in Brighton and Hove. 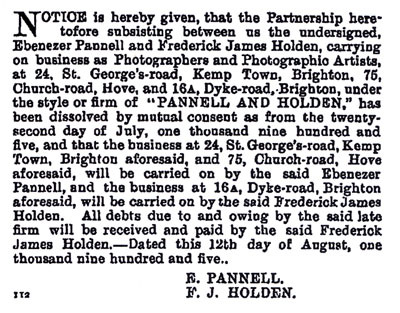 From 1900 until 1905, the firm of Pannell & Holden operated a photographic studio at 16a Dyke Road, Brighton. 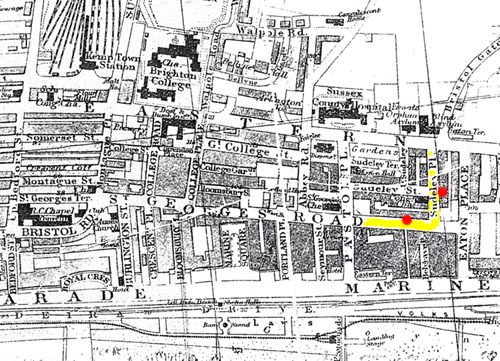 In 1905, Pannell & Holden had two studios in St George's Road, Kemp Town; one at No. 24, the other at No. 113. By 1903, Ebenezer Pannell had closed his studio at 17 Compton Avenue. Around 1905, Pannell & Holden opened a new studio in Hove at 75 Church Road. The Hove studio, which was situated close to Hove Town Hall, was to be Ebenezer Pannell's main studio for the next ten years. The partnership between Ebenezer Pannell and Frederick James Holden came to an end in July 1905. Ebenezer Pannell took on a photographer named George Barnard (born 1877, Hove, Sussex) to manage the studio at 24 St George's Road, Brighton. 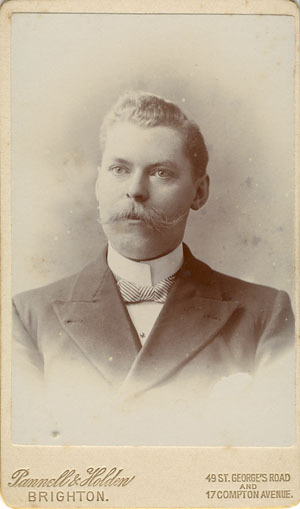 When Frederick James Holden returned to his studio in Burgess Hill around 1906, Ebenezer Pannell invited George Barnard to join the firm as a partner. By 1907, the photographic studio at 24 St George's Road, Brighton, traded under the name of Pannell & Barnard. [ABOVE] The trade plate of Pannell & Holden of 24 St George's Road and 16A Dyke Road, Brighton (c1905). [ABOVE] The trade plate of Pannell & Holden of 49 St George's Road and 17 Compton Avenue, Brighton (c1901). [ABOVE] A notice published in The London Gazette on 15th August 1905 announcing the dissolution of the partnership between Ebenezer Pannell and Frederick James Holden, who had been trading under the studio name of Pannell & Holden at three studios in Brighton and Hove. Ebenezer Pannell retained the studios at 24 St George's Road, Brighton and 75 Church Road, Hove and Frederick James Holden carried on as a photographer under his own name at 16a Dyke Road, Brighton. [ABOVE] Church Road, Hove as seen in a picture postcard produced around 1905, the year that Ebenezer Pannell established a photographic portrait studio at 75 Church Road, Hove. [ABOVE] A cabinet portrait of a young couple by Frederick James Holden, No.2 Southdown Villas, opposite church, Burgess Hill, Sussex (c1899). Frederick James Holden was born at Pulborough, Sussex, in January 1873, the son of Harriet and Frederick Holden, a railway signalman. During the early 1890s, when he was just a teenager, Frederick James Holden was employed as a photographer�s assistant in one of Ebenezer Pannell�s studios. The 1891 census records Frederick Holden as an 18 year old "Photographer" at 28 Sudeley Place, Brighton, one of the two studios operated by Ebenezer Pannell and his sister Frances Pannell. At the time of the 1891 census, Ebenezer Pannell was residing with his wife and children at 49 St George's Road, Brighton and eighteen year old Frederick Holden was lodging with Miss Fanny Pannell at 28 Sudeley Place, Brighton. By 1895, Frederick James Holden had established his own photographic studio, first at 6 Bank Buildings, Burgess Hill and then at 2 Southdown Villas, opposite the church in Church Road, Burgess Hill. During the First Quarter of 1896, Frederick Holden married Martha Harriet Grover (born 1871, Brighton), the daughter of Mary and Charles Grover, who worked as a saddler in Brighton. 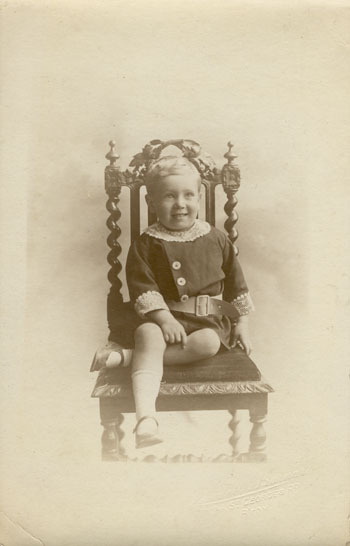 Frederick and Martha's only child, a boy named Frederick Donovan Holden, was born in Brighton or Hove in 1905. [The birth of Frederick Donovan Holden was registered in the Sussex district of Steyning during the 4th Quarter of 1905. At this time, Hove was included in the Steyning registration district]. In 1900, after four years as a photographer in Burgess Hill, Frederick Holden was invited to join his former employer in a business partnership, to trade under the name of Pannell & Holden. The partnership between Frederick Holden and Ebenezer Pannell was dissolved in July 1905. Pannell & Holden's former studio at 16a Dyke Road, Brighton passed to Frederick Holden, but after a year or so, Holden sold the studio to Mrs Ada Schofield (born 1859, Cheltenham) and returned to Burgess Hill. Between 1907 and 1909, Frederick James Holden operated a photographic portrait studio in Church Road, Burgess Hill. After a couple of years, Frederick Holden and his family left Burgess Hill to set up a new photographic studio in Reigate, Surrey. When the census was taken on 2nd April 1911, Frederick James Holden was living with his wife and five year old son at 13 St Mary's Road, Reigate, Surrey. On the census return, Frederick James Holden is described as a thirty-eight year old "Photographer". To make ends meet, Frederick and Martha Holden had taken in a trio of lodgers, all three of them young bakery workers - Adeline Spicer, a twenty-one year old baker's assistant from Deal in Kent, Percy Bate, a teenage baker baker from Holmwood in Surrey and fifteen year old Albert Hasbird, a "pastry cook apprentice" from Windsor. The 1913 edition of Kelly's Directory of Sussex lists Frederick J. Holden as a photographer at 34 High Street, Reigate, Surrey. Frederick James Holden died in Dorking, Surrey, in 1929, at the age of 56. The following year, Frederick Donovan Holden, married Winifred M. Bailey in Dorking. 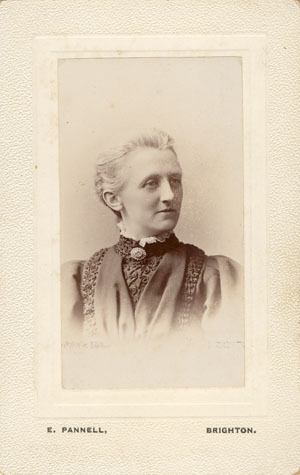 Mrs Martha Harriet Holden, Frederick's widow, died in Brighton in 1944, aged 72. [ABOVE] A notice published in The London Gazette on 8th March 1907 announcing the dissolution of the partnership between Ebenezer Pannell and George Pannell, who had been trading under the studio name of Pannell & Barnard at 24 St George's Road, Brighton. When Frederick James Holden, Ebenezer and Fanny Pannell's partner in the firm of Pannell & Holden, decided to return to Burgess Hill around 1906, Ebenezer Pannell invited his studio manager George Barnard to join the firm as a partner. George Barnard was born in Brighton or Hove around 1877. 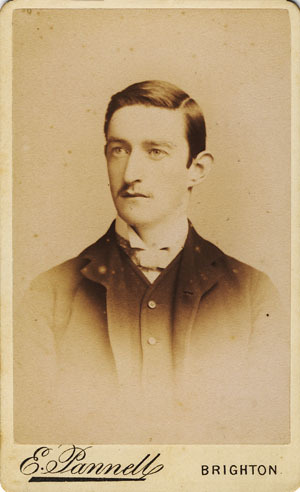 As a young man, Barnard found work as a "Photographic Printer" in Liverpool. In 1902, while living in the Toxteth district of Liverpool, George Barnard married a local dressmaker named May Russell (born 1875, Burton-on-Trent, Staffs). In 1904, George and May Barnard became the parents of a baby boy named George Gordon Barnard (born 1st Qtr of 1904, Toxteth Park, Liverpool). 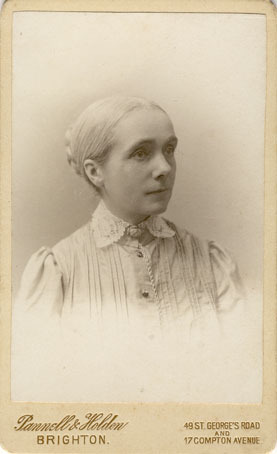 Around 1905, George Barnard returned to Brighton to work as a photographer for Ebenezer Pannell. A year or so later, George Barnard joined the firm as a partner and from 1906, the photographic studio at 24 St George's Road, Brighton went under the name of Pannell & Barnard. 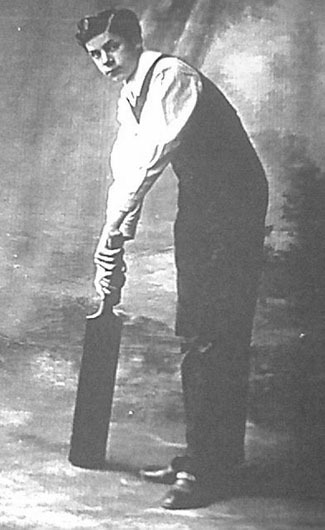 The partnership between Ebenezer Pannell and George Barnard was dissolved by mutual consent on 1st March 1907. Under the terms of the dissolution, the photographic studio at 24 St George's Road, Brighton, was retained by George Barnard. The agreement signed by Ebenezer Pannell and George Bernard on 2nd March 1907, clearly states that "all debts due to and owing by the said firm" (Pannell & Barnard of 24 St George's Road, Brighton) were to be "received and paid by the said George Barnard". During the 3rd Quarter of 1908, George Barnard's wife gave birth to a second child, a boy named Roy Mayne Barnard. When the 1911 census was taken, George Barnard and his family were recorded at living quarters attached to the photographic studio at 24 St George's Road, Brighton. 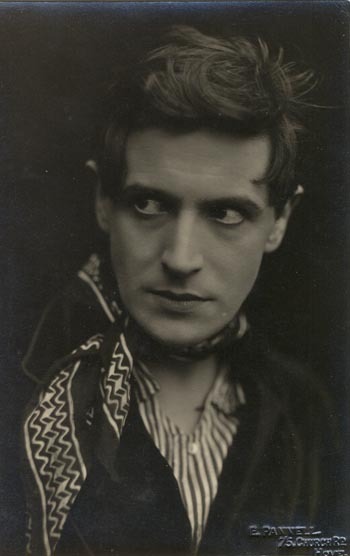 On the census return, George Barnard is described as a thirty-three year old "Photographic Artist" and his place of birth is given as Hove, Sussex. Also recorded on the 1911 census return is George's wife, thirty-six year old May Barnard, and their two young sons, seven year old George Barnard junior and two year old Roy Mayne Barnard. (Another son, Eric Barnard, was born in Brighton during the 2nd Quarter of 1913). Although it is apparent from a dissolution of partnership notice published in The London Gazette that Ebenezer Pannell and George Barnard went their separate ways in March 1907 (see the copy of the Notice illustrated on the left), it appears that Barnard continued to produce photographs under the name of Pannell & Barnard up until the end of the First World War. [ABOVE] An extract from the trades section of the 1913 edition of Kelly's Directory of Sussex, listing the firm of Pannell & Barnard at 24 St. George's Road, Kemp Town, Brighton. [ABOVE] "Play Up Brighton". The star players of Brighton & Hove Albion Football Club Team as featured in a picture postcard by Ebenezer Pannell of Hove (c1911). BACK ROW: W. Hodge, Robert Whiting, Joseph Leeming. 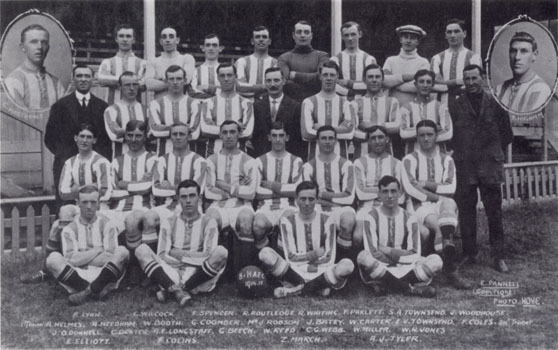 [ABOVE] The Brighton & Hove Albion Football Club Team for the 1914-15 Season, photographed by Ebenezer Pannell of Hove. At the end of the 1914-1915 Football Season, the directors of the Brighton & Hove Albion F. C. closed down the football club until the cessation of hostilities. 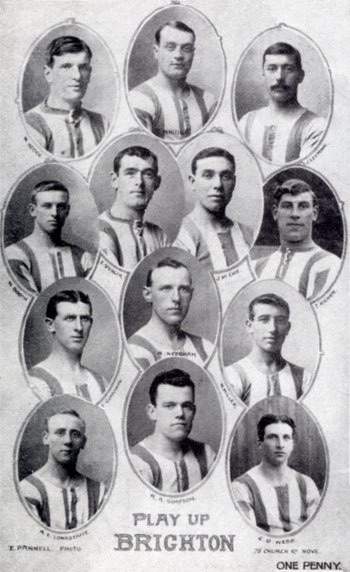 Brighton & Hove Albion F. C. was resurrected in 1919, but by this time Ebenezer Pannell had retired and so it was left to George A. Wiles to produce the team group photographs and the player portraits. In 1920, George A. Wiles of Brighton produced a group portrait of the Brighton & Hove Albion Football Team assembled for the 1920-1921 season and photographed a number of the star players, issuing the team photographs and the individual photographic portraits as souvenir picture postcards. [ABOVE] A section of the home crowd at the Charity Cup Match between Brighton & Hove Albion Football Club and Southampton Football Club held at the Goldstone Ground on 15th November 1911. 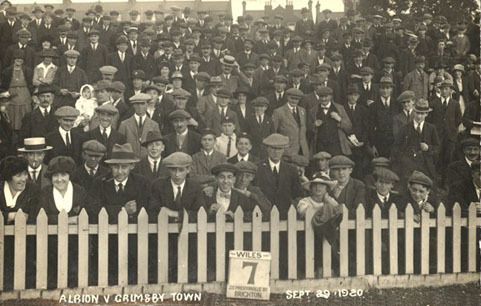 Crowd photographed by George A. Wiles of Hove. 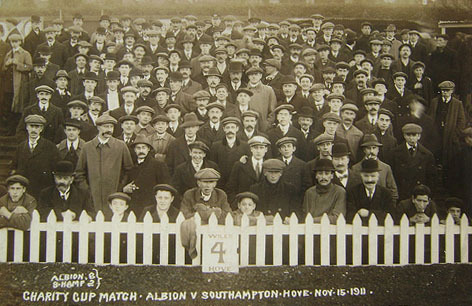 Between 1910 and 1922, photographs featuring the teams, individual players and crowds at Brighton & Hove Albion Football Club were produced by George Albert Wiles, the younger brother of Thomas W. S. Wiles (born 1870, Hastings) a postcard publisher based in George Street, Hove. George Albert Wiles was born in Hastings, Sussex, on 2nd April 1877. After working as a shop assistant and a commercial traveller, George Wiles became a professional photographer, settling in Hove with his wife and two children around 1910. The 1911 census records George Albert Wiles as a thirty-four year old "Photographer" living at 15 New Town Road, Hove, with his wife Jane and their two daughters, Violet, aged 4, and two year old Mabel. 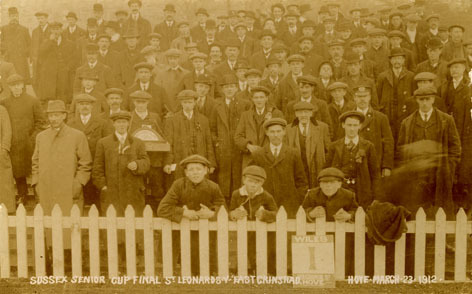 George Wiles took his first photographs at the Brighton & Hove Football Club ground at Goldstone, Hove, early in 1910. From around 1914, George Wiles was based in Brighton. By 1922, George Wiles had entered into a business partnership with Arthur Harry Deane (born 1872, Brighton) and another photographer named Martin (later replaced by a photographer named Millar). The firm of Deane, Wiles & Millar were still producing the team photographs for Brighton & Hove Albion Football Club at the outbreak of the Second World War. 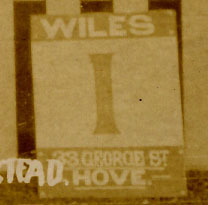 [ABOVE] The board which identifies the photographer as Wiles of 33 George Street, Hove. 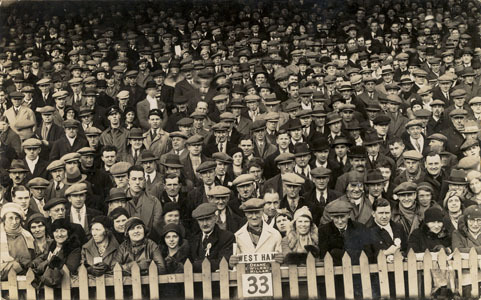 [ABOVE] A section of the home crowd at the FA Cup game between Brighton & Hove Albion F. C. and West Ham United at the Goldstone Ground on Saturday 18th February 1933. The game was drawn 2-2 These football fans were probably photographed by George Wiles, who was then a partner in the firm of Deane, Wiles & Millar. The photographer's board displays the number of the photograph (No. 33) and the name of the photographic firm which produced the picture postcard - Deane, Wiles & Millar. 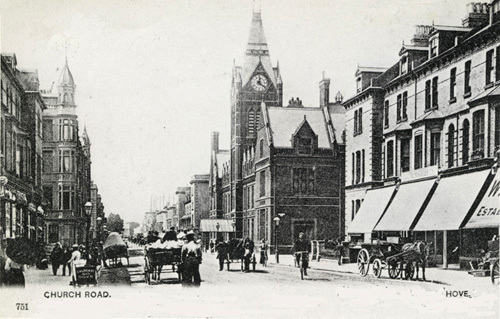 [ABOVE] Church Road, Hove as seen in a picture postcard produced around 1910. 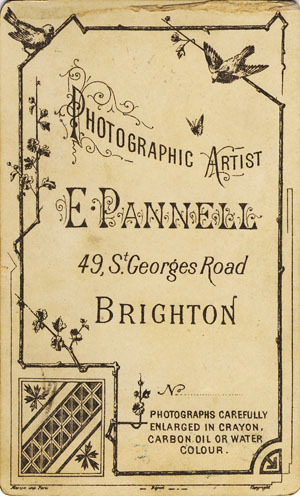 Ebenezer Pannell established a photographic portrait studio at 75 Church Road, Hove, around 1905. Pannell's studio was situated in the row of buildings shown on the right. The clock tower of the old Hove Town Hall can be seen in the distance. From around 1905, Ebenezer Pannell was based at 75 Church Road, Hove. Initially he was assisted at the Hove studio by his son Ebenezer William Pannell (born 1886) and his daughter Ella Mary Pannell (born 1888, Brighton). Around 1911, Ebenezer William Pannell established his own photographic studio in Burgess Hill and over the next five or six years he was based in Mid Sussex. When Ebenezer Pannell senior retired around 1916, Ebenezer William Pannell returned to Hove to run his father's studio. [ABOVE] Postcard portrait of an unidentified man in costume (probably an actor), photographed at Ebenezer Pannell's photographic studio at 75 Church Road, Hove (c1912). [ABOVE] A photograph taken in 2004 showing the site of Ebenezer Pannell's photographic portrait studio at 75 Church Road, Hove. The street-level entrance to No. 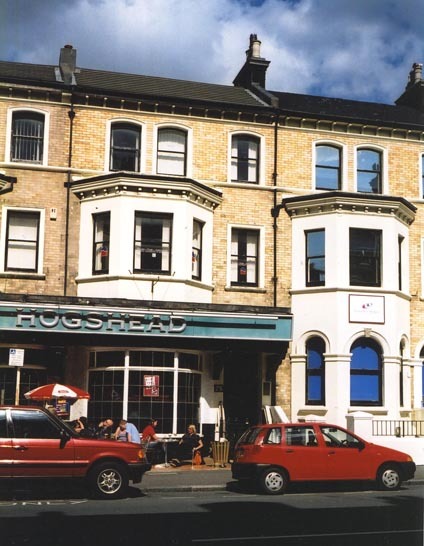 75 Church Road can be seen in the middle of this photograph to the right of the Hogshead public house ( re-named "The Blind Busker" in 2006). 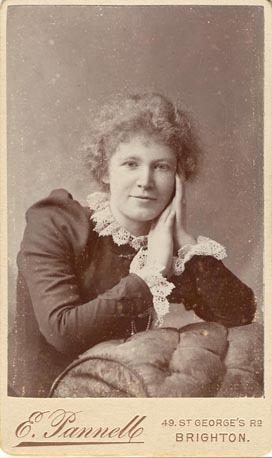 [ABOVE] Postcard portrait of an unknown woman holding a book, photographed at Ebenezer Pannell's photographic studio at 75 Church Road, Hove (c1910). 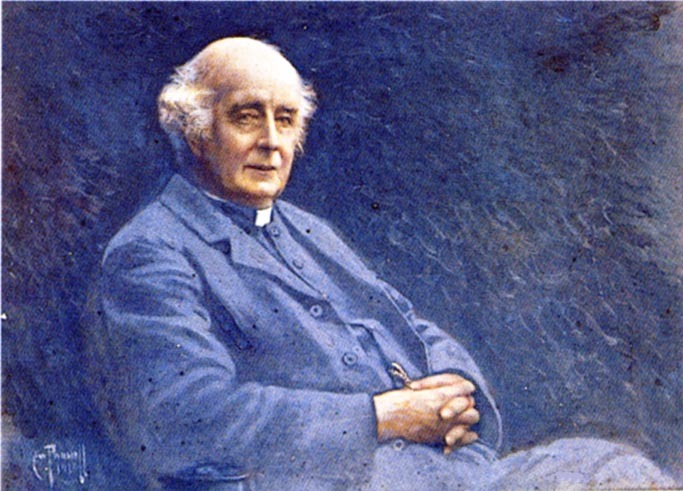 [ABOVE ] Portrait of the Reverend Charles Marsh Ainslee Tower (1849-1927) by Ebenezer William Pannell (1918). Charles Marsh Ainslee Tower was born in Chilmark, Wiltshire in 1849. 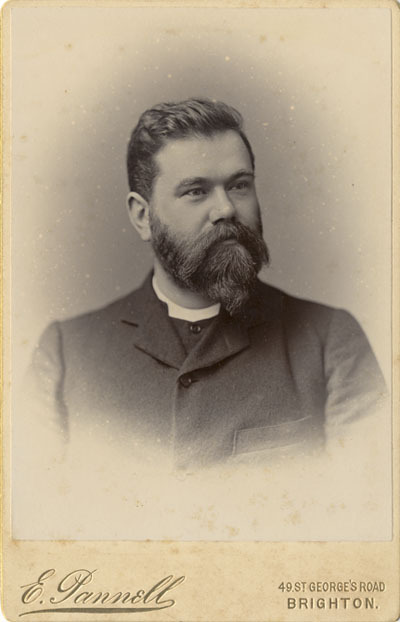 Rev Charles M. A. 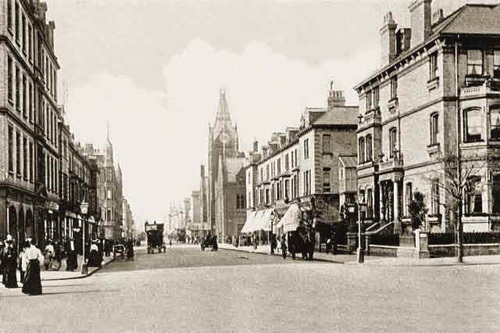 Tower became the Vicar of New Shoreham on 2nd June 1894. A few years later Reverend Tower was appointed Vicar of both New Shoreham and Old Shoreham. By 1897, Reverend Tower was known as the Vicar of Shoreham. Reverend Tower resided at The Vicarage, Shoreham, until his preferment to the living of Ashurst, West Sussex, in 1920. Reverend Charles Marsh Ainslee Tower, formerly the Vicar of Shoreham and the Rector of Ashurst, died in Mid-Sussex in 1927 at the age of 78. Although this portrait of Reverend Tower was painted in oils, it appears to have been based on a photographic portrait. [ABOVE] Ebenezer Pannell (junior) listed as the proprietor of photographic studios in Hurstpierpoint, Haywards Heath and Hove in the 1924 edition of Kelly's Directory of Sussex. Ebenezer Pannell (senior) had retired during the First World War and his eldest son Ebenezer William Pannell had taken over the running of the studio at 75 Church Road, Hove. In addition to the Hove studio, Ebenezer William Pannell owned a studio at 9 Boltro Road, Haywards Heath and the Park View Studio in Hassocks Road, Hurstpierpoint. Ebenezer Pannell junior later closed the studio in Hurstpierpoint and arranged for his sister Eva Pannell to take charge of Pannell's Studio in Boltro Road, Haywards Heath. Ebenezer William Pannell, Ebenezer Pannell senior's eldest son, was born in Brighton in 1886. 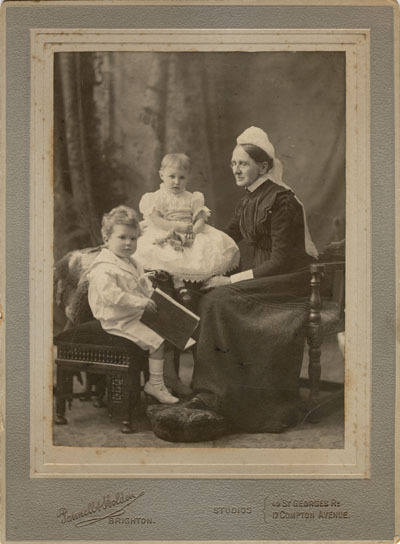 [The birth of Ebenezer William Pannell was registered in Brighton during the 4th Quarter of 1886 in Brighton]. It is likely that during his teenage years, Ebenezer Pannell junior was trained in the art and science of photography by his father Ebenezer Pannell senior (1860-1934), who had worked as a professional photographer in Brighton since the early 1880s. At the time of the 1911 census, Ebenezer William Pannell was a single man of twenty-four living with his aunt and his two sisters at 75 Church Road, Hove. Ebenezer's aunt, Miss Frances Pannell, the sister of Ebenezer Pannell senior, declared on the census return that she was living on "Private Means", but both Ebenezer Pannell junior and his twenty-two year old sister Ella Mary Pannell give their occupation as "Photographic Artist". It appears that when the census was carried out on 2nd April 1911, Ebenezer Pannell senior was away from home. 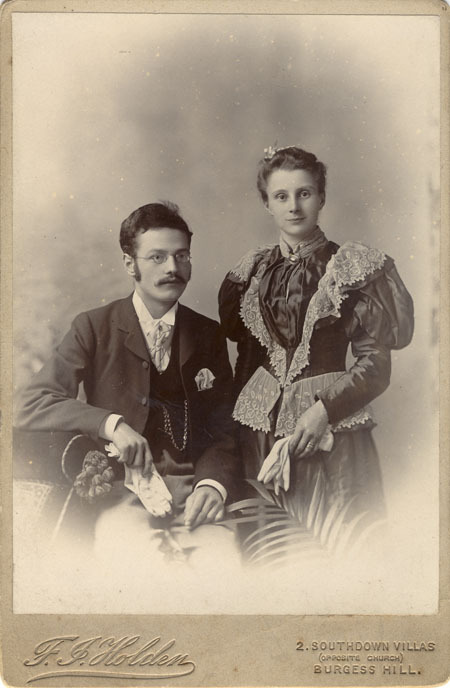 Ebenezer William Pannell and his sister Ella Pannell (who is described as "Head of Household") were managing their father's photography business in Church Road, Hove, during the older photographer's absence. Ebenezer William Pannell married Daisy Kathleen Nutley (born 1886, Hove, Sussex) in Brighton during the 2nd Quarter of 1911. 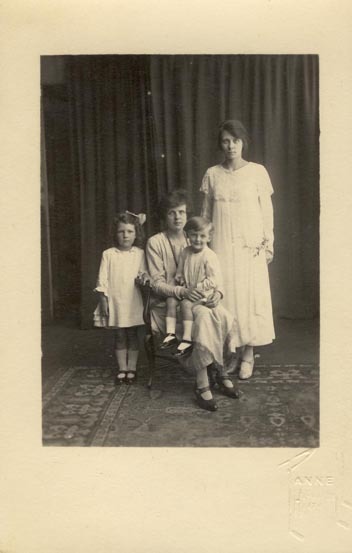 The couple's first child, Sylvia Pannell, was born in Burgess Hill towards the end of 1912. [The birth of Sylvia M. Pannell was registered in the Mid-Sussex district of Cuckfield during the 4th Quarter of 1912]. At this time, Ebenezer William Pannell was operating a photographic studio at 53 Church Road, Burgess Hill. At the outbreak of the First World War, Ebenezer William Pannell was nearly twenty-eight years of age. In March 1916, all unmarried men aged between 18 and 41 were liable to be conscripted into military service. On 25th May 1916, military conscription was extended to include married men. In June 1917, thirty-year old Ebenezer Pannell faced a Local Tribunal to present a case for exemption from military service. Pannell was successful in his appeal to the Tribunal and he was declared exempt from military service under category C3. By the end of the First World War, Ebenezer William Pannell had taken over his father's photographic portrait studio at 75 Church Road, Hove. Ebenezer William Pannell was from a Non-Conformist religious background and might have objected to the Great War on moral grounds. Perhaps it was significant that E. W. Pannell photographed the "Peace Day Celebrations" in Hove on 19th July 1919. E. W. Pannell's photographs of this occasion were later published as illustrations to Henry M. Walbrook's book "Hove and the Great War" (1920). From the late 1930s, Ebenezer William Pannell was operating his studio in Church Road, Hove under the name of E. W. Pannell Limited. Pannell's studio at 75 Church Road, Hove was still in business at the end of the Second World War. On the evening of Wednesday, 20th February 1946, the Brighton & Hove Camera Club organised a visit to E. W. Pannell's premises at 75 Church Road, Hove, to study the lighting used in studio portraiture. Ebenezer William Pannell died in 1951, aged 64. 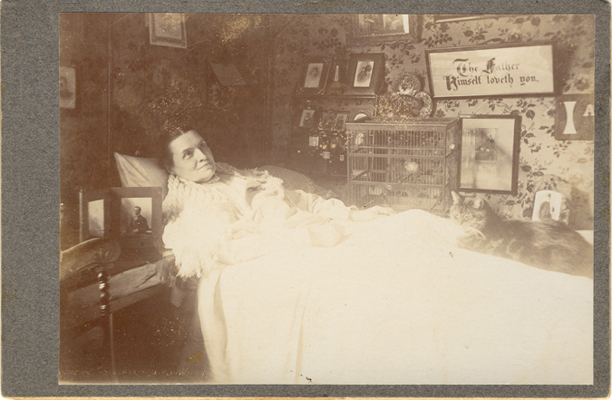 [The death of Ebenezer William Pannell was registered in the district of Lewes during the 1st Quarter of 1951]. 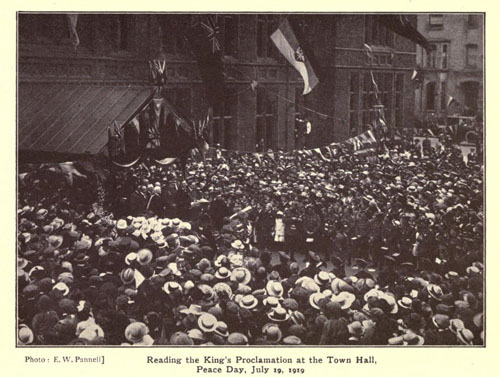 [ABOVE] "Reading the King's Proclamation at the Town Hall, Peace Day, July 19th, 1919", one of the photographic illustrations provided by Ebenezer William Pannell for the book "Hove and the Great War" by Henry M. Walbrook (1920). 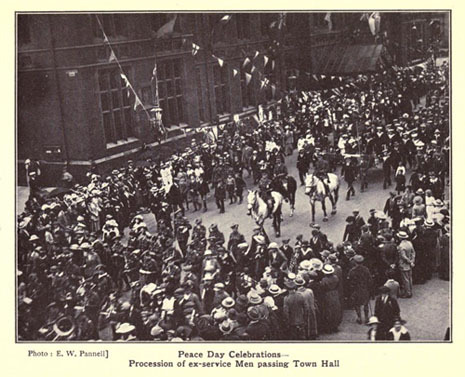 [ABOVE] "Peace Day Celebrations- Procession of Ex-Service Men passing the Town Hall", another of the photographic illustrations provided by Ebenezer William Pannell for the book "Hove and the Great War" by Henry M. Walbrook (1920). [ABOVE] Extract from the trades section of the 1913 edition of Kelly's Directory of Sussex, listing the studios associated with Ebenezer Pannell and his son Ebenezer William Pannell. 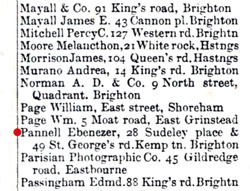 When this listing of photographic studios was published in 1913, Ebenezer Pannell senior was based in Church Road, Hove, while his son Ebenezer William Pannell managed photographic studios in Burgess Hill and Haywards Heath. Ebenezer William Pannell, Ebenezer Pannell senior's eldest son, was born in Brighton in 1886. Between 1911 and 1923, Ebenezer William Pannell operated photographic studios in Burgess Hill and Haywards Heath. 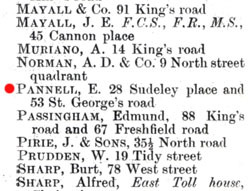 Trade directories published during this period list Ebenezer William Pannell as the proprietor of studios at 53 Church Road, Burgess Hill (1911-1915), Heathfield, Perrymount Road, Haywards Heath (1913-1915) and 9 Boltro Road, Haywards Heath (1916-1924). Ebenezer William Pannell also owned a studio at Park View, Hassocks Road, Hurstpierpoint, between 1918 and 1924. [ABOVE] Ebenezer William Pannell listed as the proprietor of photographic studio at 75 Church Road, Hove, in the Trades section of the 1930 edition of Kelly's Directory of Sussex. 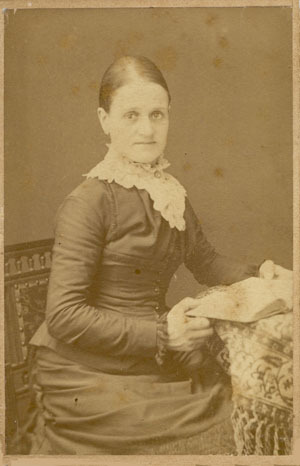 In the same directory listing, Miss Eva Pannell, the youngest sister of Ebenezer William Pannell is shown as the proprietor of Pannell's former studio at 9 Boltro Road, Haywards Heath. 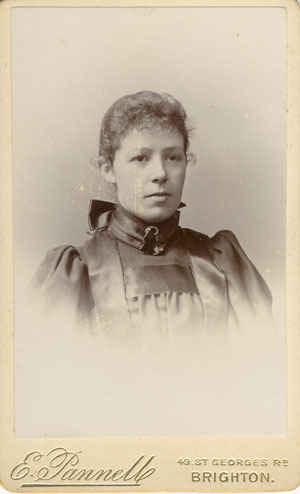 Eva Sarah Pannell was born in Brighton in 1896, the youngest daughter of Ebenezer Pannell senior, a professional photographer active in Brighton and Hove. Eva Pannell was the youngest sister of Ebenezer William Pannell (1886-1951), who managed the Pannell studios in Burgess Hill and Haywards Heath during the First World War. After assisting her father Ebenezer Pannell senior at his Hove studio, Eva Pannell re-located to Haywards Heath to help her brother Ebenezer William Pannell run Pannell's Studio in Haywards Heath. When Ebenezer Pannell senior retired around 1917, Ebenezer William Pannell returned to Hove to manage his father's former studio at 75 Church Road, Hove. Pannell's studio in Haywards Heath eventually passed to Eva Pannell, Ebenezer Pannell senior's youngest daughter. Miss Pannell was the sole proprietor of the photographic portrait studio at 9 Boltro Road, Haywards Heath, throughout the 1930s. Eva Pannell was primarily a portrait photographer, taking portraits of some of the leading figures in Haywards Heath and the surrounding area. During the 1930s, Eva Pannell was the leading photographer in Haywards Heath. In 1936, Eva Pannell was commissioned to take the official group photograph of the Haywards Heath Division of Sussex Police. In 1938, Eva Pannell's photographs illustrated The Official Guide to Haywards Heath, Cuckfield and Lindfield (published by Charles Clarke in 1938). [ABOVE] A photographic portrait of Margery Corbett Ashby (1882-1981) by Eva Pannell of Haywards Heath. The portrait is signed in pencil "Eva Pannell, Haywards Heath" in the bottom right-hand corner of the card mount. Margery Corbett Ashby, the subject of this portrait was a well-known feminist and was active in the Liberal Party and the Women's Suffrage Movement. Mrs Ashby was born Margery Irene Corbett on 19th April 1882, the daughter of Marie and Charles Henry Corbett, a barrister and Liberal MP for East Grinstead. Margery Corbett was born and raised in Danehill, a Sussex village five miles north-east of Haywards Heath, where Eva Pannell had her studio. 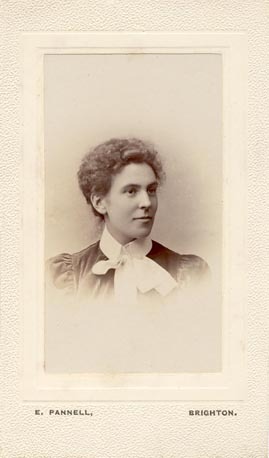 In 1907, Margery Corbett was appointed Secretary of the National Union of Women's Suffrage Societies. On 22nd December 1910, Margery Corbett married the lawyer and barrister Arthur Brian Ashby and from this date she was known as Margery Corbett Ashby. The couple had one child Michael Ashby (born 1914), who later achieved fame as a neurologist. 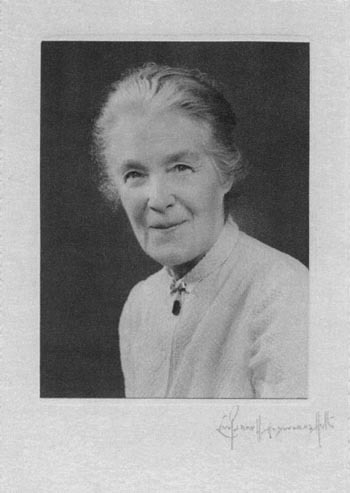 Margery Corbett Ashby, campaigned for social justice over a period of 80 years. Margery Corbett Ashby died on 22nd May 1981, at the age of 99. Eva Sarah Pannell (1896-1983) was the sole proprietor of the photographic portrait studio at 9 Boltro Road, Haywards Heath throughout the 1930s. 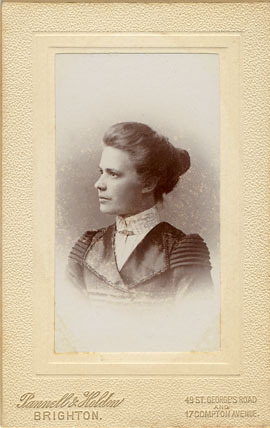 During this period Eva Pannell took on the role as the official photographer in Haywards Heath, creating portraits of local dignitaries and supplying photographs for official guides to Haywards Heath. Eva Pannell was also commissioned to take group photographs of the local police force. [ABOVE] Procession at Burgess Hill, photographed by Ebenezer William Pannell around 1912. 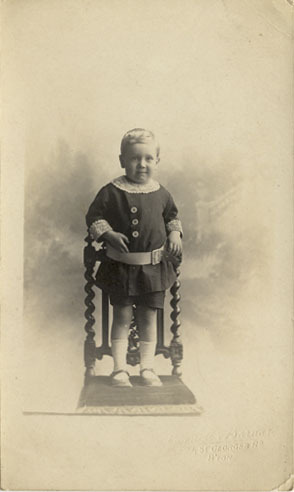 Ebenezer William Pannell (1886-1951) was the eldest son of the Brighton photographer Ebenezer Pannell senior (1860-1934). Ebenezer William Pannell established a photography business at 53 Church Road, Burgess Hill, about 1911. Around 1917, Ebenezer William Pannell left Mid-Sussex and returned to Hove to take over his father's photographic studio at 75 Church Road, Hove. This picture postcard is embossed in the lower left-hand corner with the photographer's credit "E. W. Pannell, Burgess Hill". Ebenezer William Pannell was primarily a portrait photographer, but he is known to have produced a number of picture postcards depicting views and local events. When he was based in Burgess Hill and Haywards Heath, E. W. Pannell issued picture postcards recording significant or newsworthy local events. 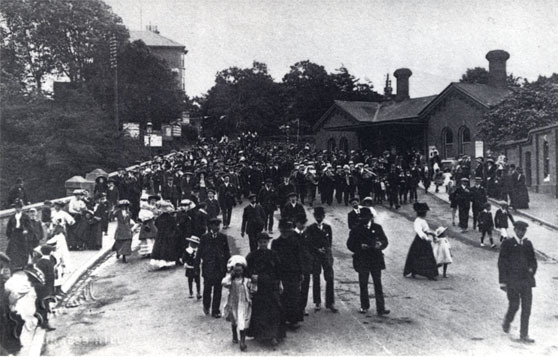 Around 1912, E. W. Pannell recorded a celebratory procession which took place in Burgess Hill. In the picture postcard gallery devoted to Ebenezer William Pannell on Rendell Williams' Sussex Postcards website, there is a post card produced by E. W. Pannell (dated 21st October 1915), which shows firemen combating a fire at the Corn Stores in the Market Place in Haywards Heath. Thanks to Peter Cannings-Bushell and Erryn Pannell for supplying copies of the Pannell family photographs. Erryn Pannell is the great grand daughter of Ebenezer Pannell. Peter and Erryn, if you read this acknowledgement, please contact me via my Home Page - David Simkin. I am grateful to David Ticehurst who generously gave me permission to feature the photographs by Ebenezer Pannell which figured in his wonderful collection of Brighton & Hove Albion Football Club picture postcards.